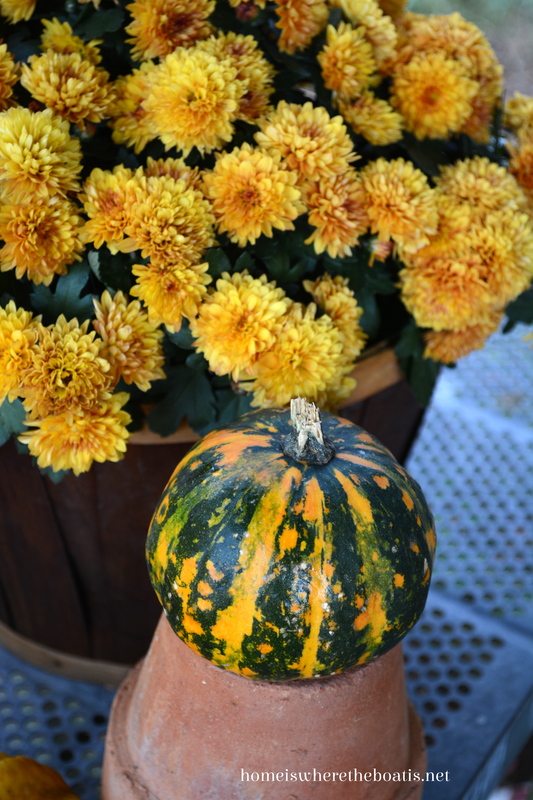 Potting Shed: Pumpkins, Gourds, and Mums! to harvest some fall color around my Potting Shed! along with pumpkins, gourds and mums! transferware lid hanging in greeting on the door. 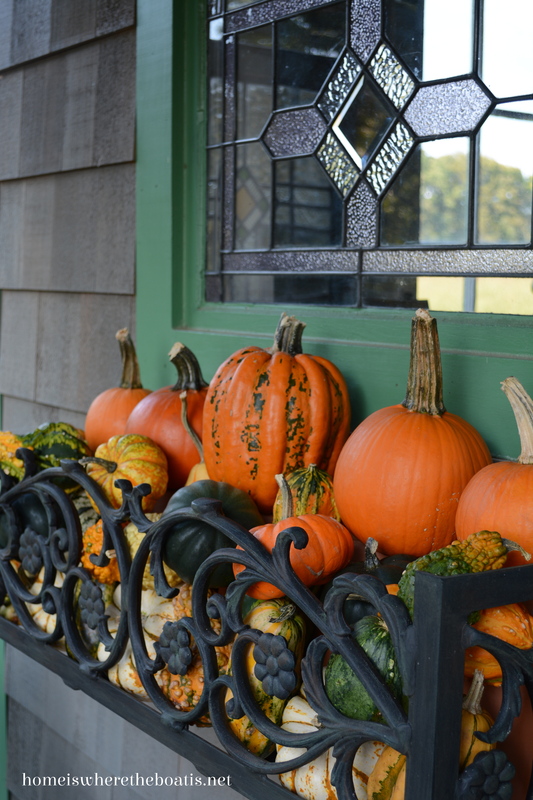 a medley of gourds and pumpkins for the season. 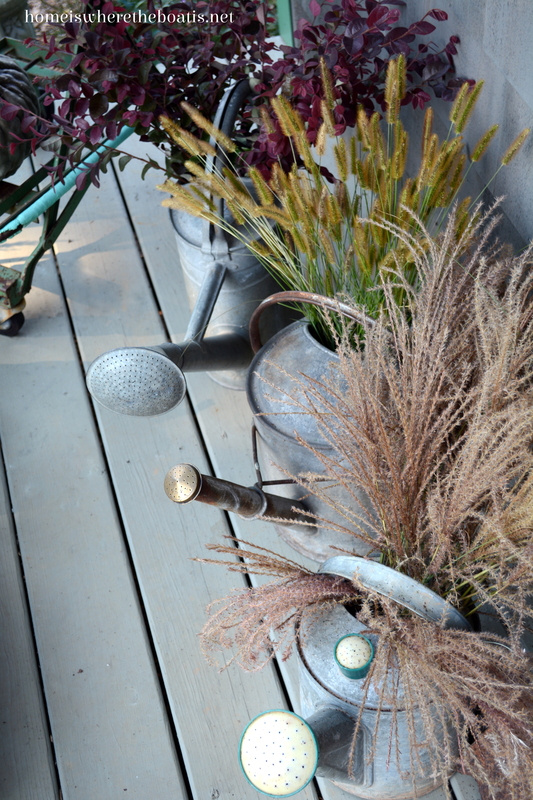 Watering cans are filled with fall grasses and foliage. 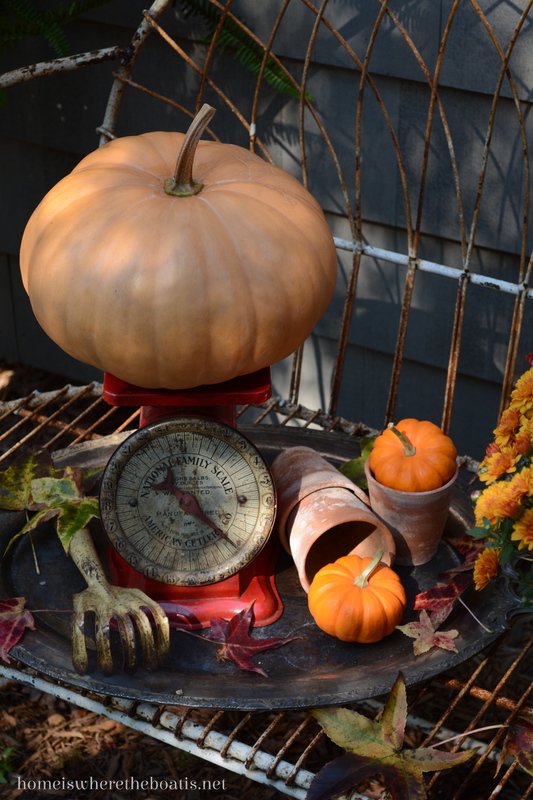 I hope you’re enjoying a little fall weather where you are! ← Drink Up Witches Halloween Potion and Winners! 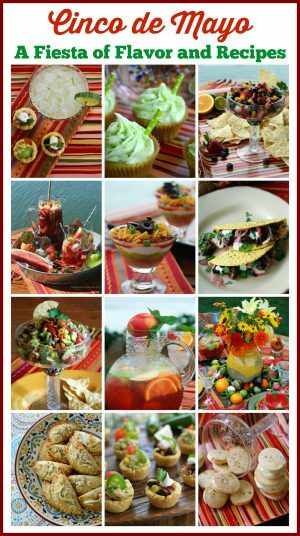 Love it, Mary!…always find at least one little idea that I can “borrow” from your beautiful posts…and usually several! 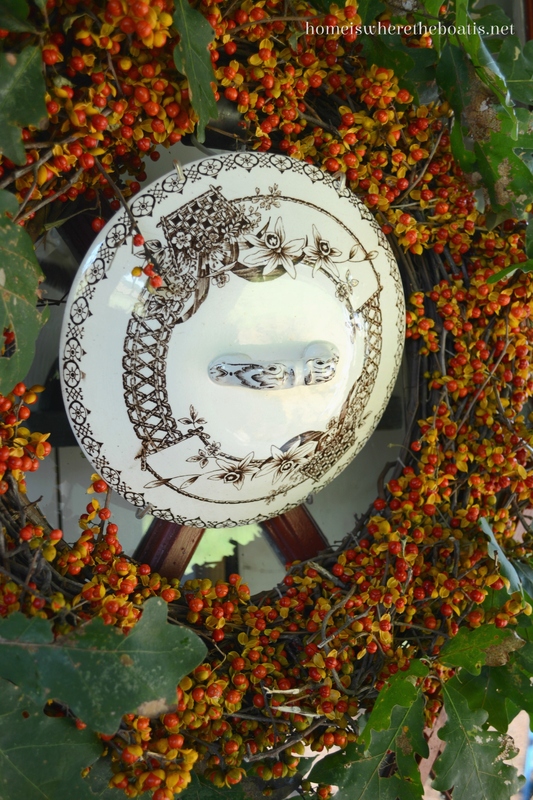 What a creative idea to use a transferware lid hanging on the door…I never would have thought about doing that! 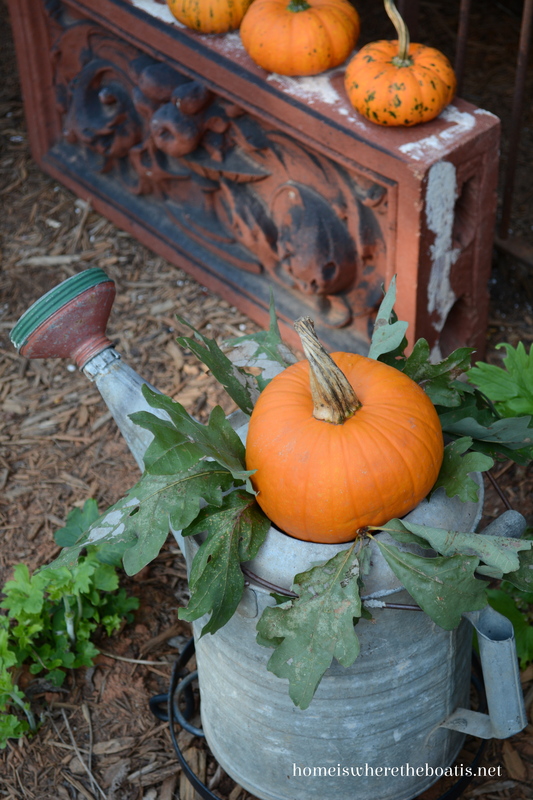 I’m going to copy your idea of the pumpkin on the galvanized sprinkling can just as soon as the sun comes up! I only copy from the best, you know. Everything looks so lovely & welcoming, Mary. Always such a pleasure to start my day with a visit to your place. 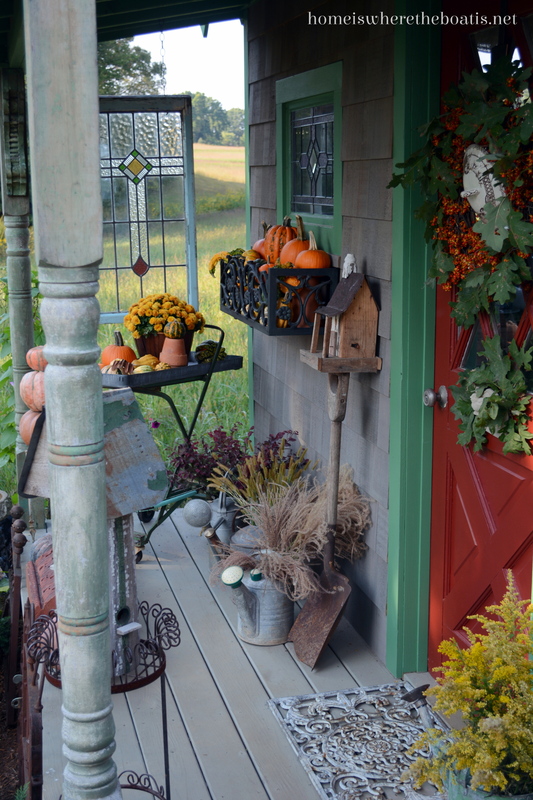 Your potting shed looks happy in its Fall splendor, Mary! 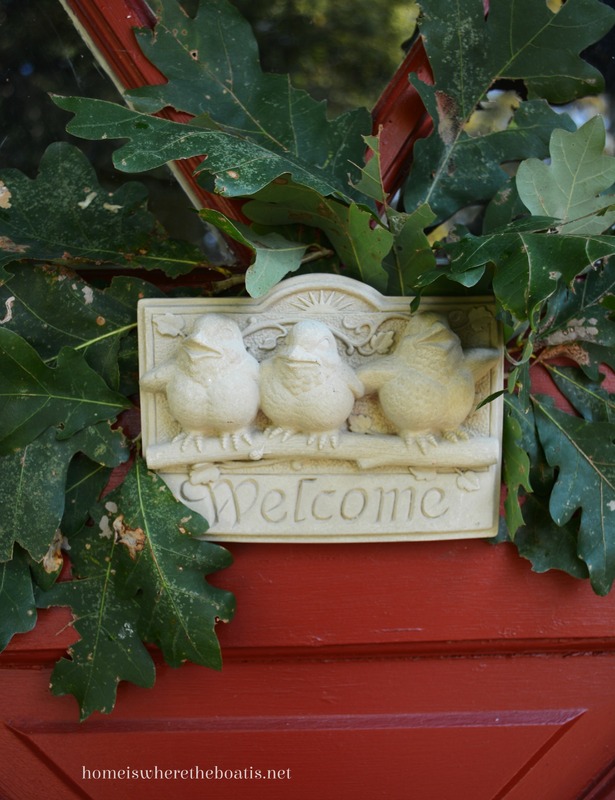 I love your wreath with the transferware wreath and the adorable welcome sign. I still have the A/C blasting away here in Texas! Awesome job as always…….your talent is an inspiration to us all!!!!!!!! Fall has exploded around your precious potting shed Mary! 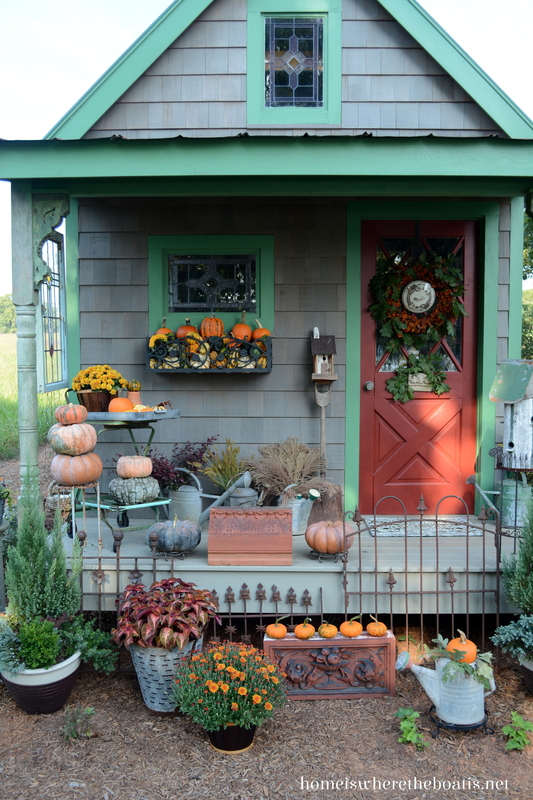 It looks the the shed itself is a proud parent with it’s lap [porch] full of pumpkin and gourd babies!! 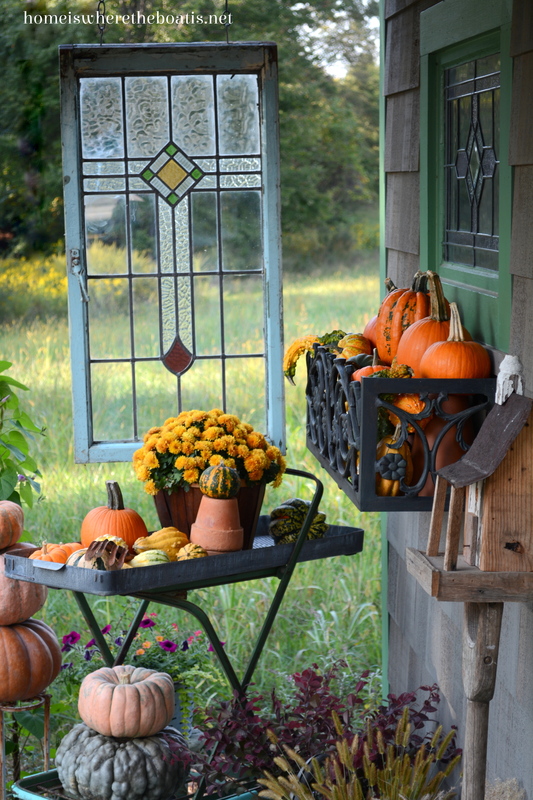 The window box is fabulous, as well as the transferware lid in the wreath~ the pumpkin in the watering can, it’s ALL adorable! Nothing makes me smile more than a scene overflowing with pumpkin fun! Just love it all. It is all perfectly done and exudes fall. 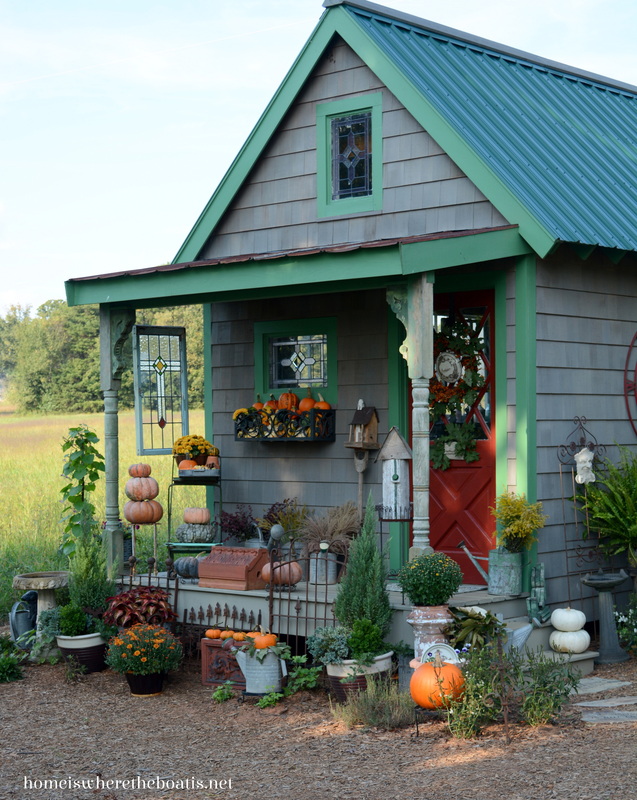 WOW…your shed sure knows how to look goood in it’s fall colors. Everything is so pretty. 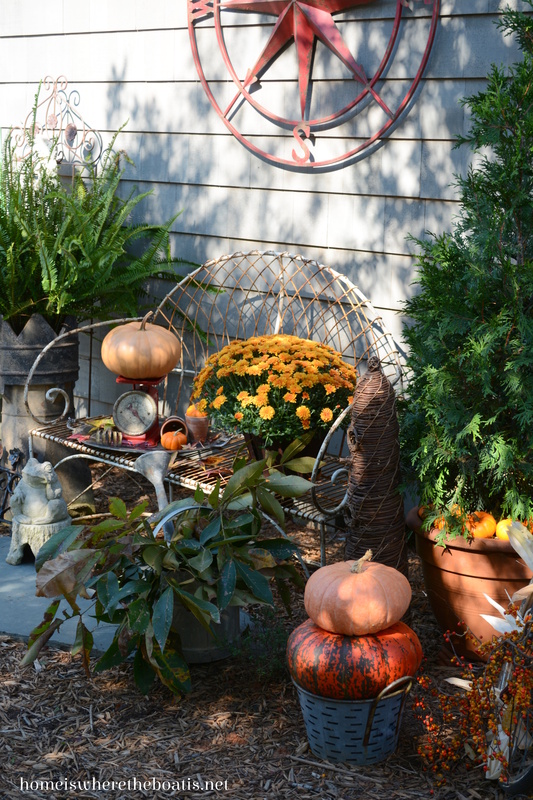 Love what you did to your shed for fall…..it looks wonderful! It is fabulous! If it was mine, i would have to sit and stare at it all day! The happiest little garden shed I have ever seen. Thanks for sharing! Thanks for the smiles, been netless and out of my computer habit. Loads to catch up on but time to thin to immerse. Adore sooo many pics! Oh, Mary, you just brightened my rainy day. Visiting the potting shed in autumn is a treat like no other with the the warm, rich colors, artful vignettes, and happy mood. I especially enjoy coming here because an imp named Teeny has rendered me pumpkinless and mumless. I am looking forward to retirement, in which I will eat full time. A beautiful post! HA to your rainy days and cooler weather! S’posed to be 96 today here in sunny California! I am desperate for some cool weather, so we are flying in close to you Mary, (wish I could see that potting shed in person!) Atlanta this coming Saturday. A visit to U of A with Granddaughter number 1 and meeting my kids at Arnold Air Force Base in Tenn. to see the littles. So, thanks for the insight on what to expect. I am so excited to see your part of the country. I’ve only had the briefest glimpse of Lake Norman, another time perhaps…. Happy Fall y’all!! 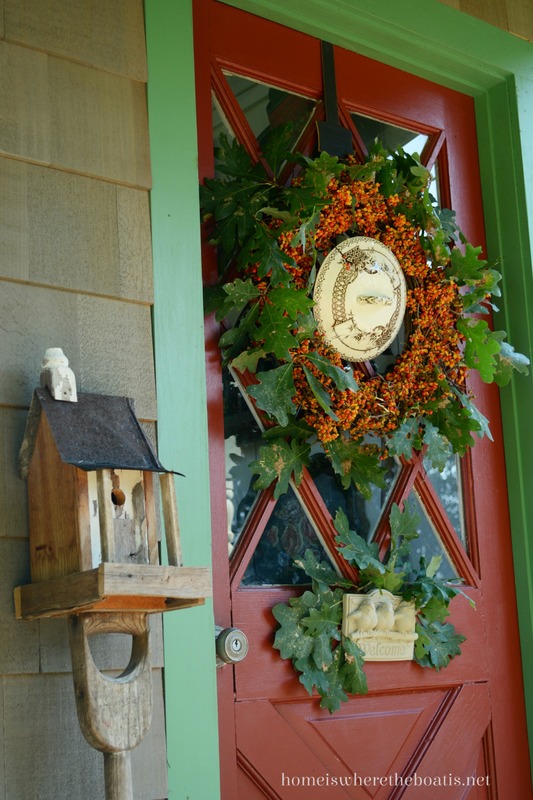 Mary, love the way you used the oak leaves to highlight the bittersweet wreath. Bittersweet says autumn to me, and I always buy bunches of it from a vendor at Round Top. Since I didn’t go this October, no bittersweet here. Hopefully one of the grocery stores will get in a supply. Be careful of fallen berries with Chloe and Gracie. I frequently check to make certain none have escaped to the floor. Sadie is like a vacuum cleaner and picks up anything she thinks is food. Bittersweet is toxic, though last year the vendor told me he grows a special not-toxic variety. Not sure about that! No bittersweet here, so I have to use pyracantha berries instead – and the closest grow about an hour away from me!!! 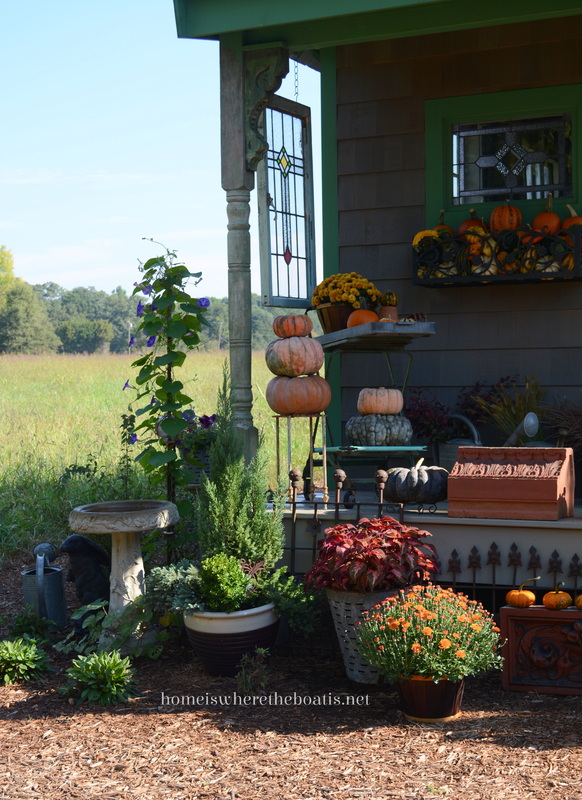 As always, your potting shed is stunning with all your pumpkins, mums, etc. Beautiful Fall colors. Yes, let’s trade weather – our’s has been in high 90’s and 102. Would love to put on a sweater, socks and long pants LOL. My flowers are really confused and ones that bloom in Spring are blooming again. Crazy!!! I love your potting shed and so dressed up in pretty autumn colors. 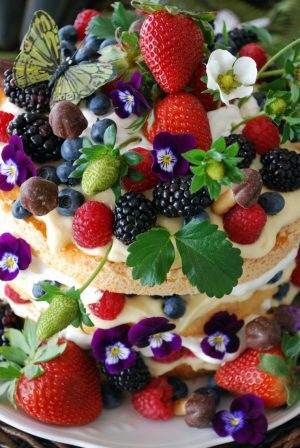 Love the BitterSweet wreath , is that real ?? 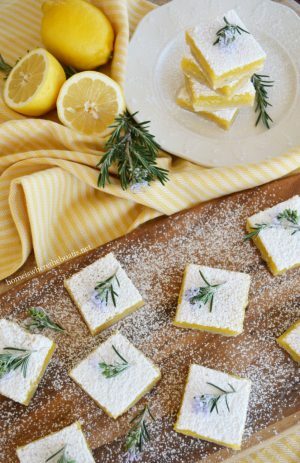 Its hard to find BitterSweet in my area . Wow, you have inspired me. You are all decked out for fall. I’ve been away and missed blogland. Your fall header is gorgeous. 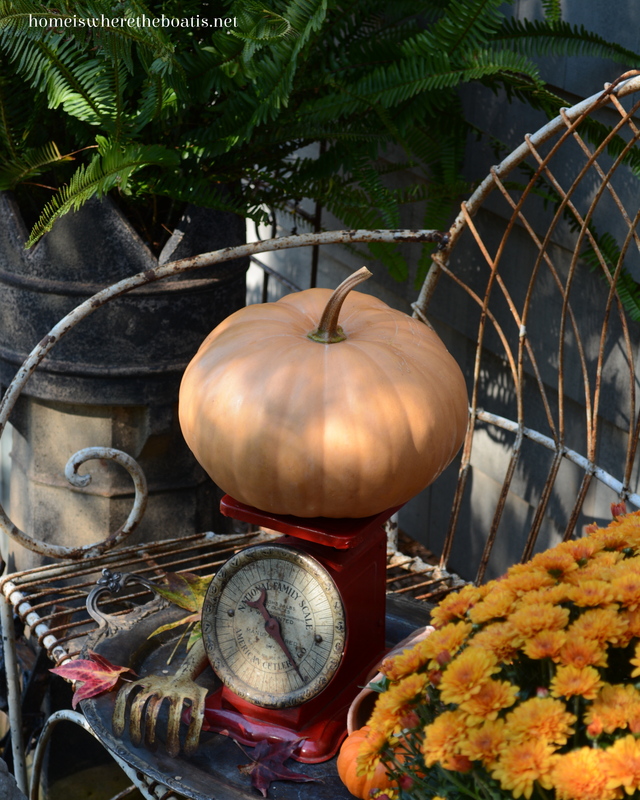 Mary, you have put me in the mood to get out and buy pumpkins and mums and other fall decor. Enjoyed my visit today. Mary, your potting shed is absolutely delightful! 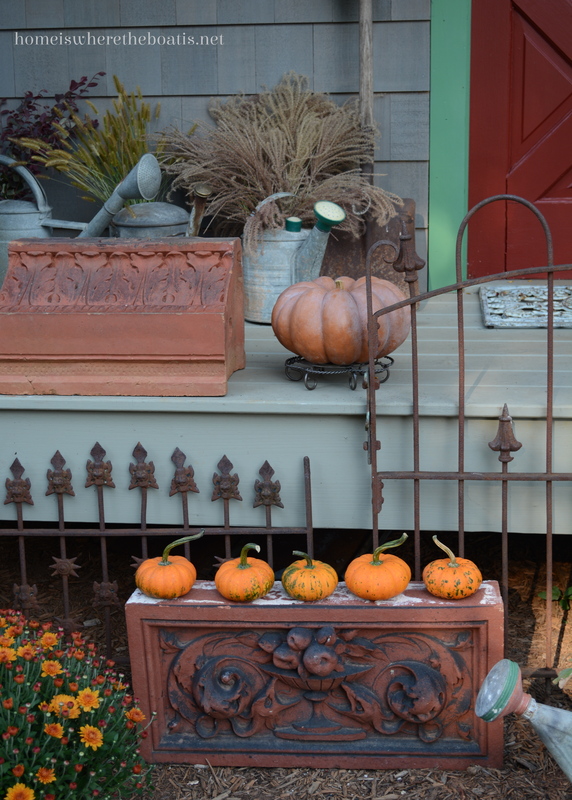 I love your window box and how you utilized it for the pumpkins…very clever. Hope you are having nice fall days. It’s been dreary and kind of drizzly off and on the last few days up here in the Brandywine Valley, but our color is starting to get nice now. Oh goodness! 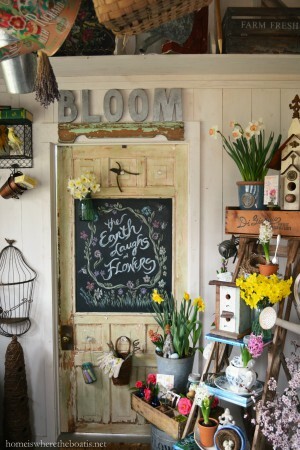 This is the cutest potting shed I have ever seen. What a gem! And so beautifully decorated for Fall. Thanks for putting a smile on my face this morning. 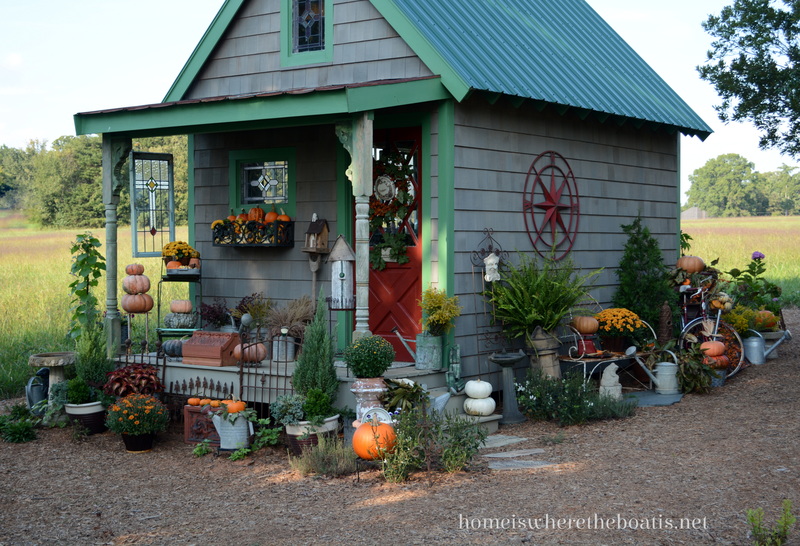 Love, love your gorgeous garden shed dressed for Fall….I feel as if it is on a beautiful farm in New England…I just “sighed” throughout this post….and must say, if that brown transferware lid goes missing…don’t call me!!! I love that wreath Mary! Great looks!